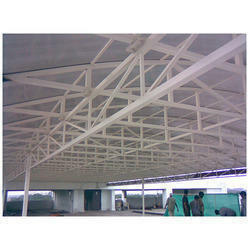 We are well-known enterprise instrumental in offering best quality Factory Shed Fabrication. Our team members are backed with the next generation techniques for designing and developing the prefabricated structures that we use for fabricating industry compliant sheds. Established in the year 2010 at Secunderabad, Telangana, we “Lubna Enterprises” are a Sole Proprietorship (Individual) based firm, engaged as the wholesaler and trader of PVC Coated Chain Link, Profile Sheet, Polycarbonate Sheet, Roofing Sheet and many more. These products are procured from the most authentic vendors of the market. Moreover, these products are offered by us at market leading prices.